Use 100% Travel cash on 1st hotel, train, cab, bus & flight bookings. Amazing discount offer on Traveling & hotel bookings. Earn more travel cash using Scratch Cards, Trivia and Predictors. GOIBIBO IPL DHAMAKA:- Get Goibibo travel cash during match play. It’s very simple to get travel cash, Simply When you watch KKR or RCB matches then you have to open Goibibo mobile app open. You will auto-collect Travel cash on every single dot ball, four, six, player half century or century, team half century or century & wickets as long as your app is open. your travel cash will be credited into your account early morning by 2 AM on the next day of the match. All earned travel cash expires at 12 midnight on the next day of the match. You have 22 hours to use this travel cash. You use 100% of this travel cash on booking all types of hotels, all types of flights, train & cabs on your 1st transaction. Travel Cash can be earned by users in every KKR or RCB Match. A user is eligible to participate in all KKR or RCB Matches. NO GOPAISA CASHBACK WIL BE GIVEN IF COMPLETE BOOKING IS DONE VIA TRAVEL CASH. GoPaisa Cashback will be given when booked from goibibo website only via gopaisa. Signin / Signup into GOIBIBO mobile app. Enroll for KKR and RCB match. login / signup into your account. Keep app open to auto-collect Travel Cash on every Dot ball, 4, 6, 50, 100s, team century & wickets. Answer the predictions during match and get more travel cash. What is Goibibo Travel Cash Fest Offer? How to Enrol in the Goibibo Travel Cash Fest? How to Earn Travel Cash with Goibibo IPL Offer? What is Goibibo IPL Discount for a New User During the Travel Cash Fest? How can Goibibo users use Travel Cash? Goibibo Travel Cash Fest is Here! Earn Travel Cash in Every RCB & KKR Cricket Match! Cricket lovers who are also explorers and love to travel have an amazing opportunity to collect Travel Cash on Goibibo. The collected Travel Cash can be later used to book ticket Flights, Hotels, Trains, etc. 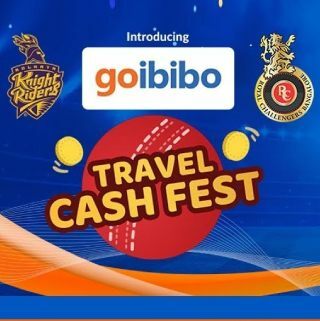 This Goibibo Travel Cash Fest, which is also becoming popular with the name Goibibo Gocash IPL offer, is initiated by Goibibo to give users multiple benefits. Whatever the outcome, you always earn loads of Travel Cash if you keep your Goibibo app open during @RCBTweets matches. What's your score today? Did you #CashTheGame? The Goibibo IPL offer or Travel Cash Fest is available only on Goibibo mobile application. First of all, install the app, and sign up/log in to your account. Next, select ‘Enroll Now’ option and keep the application open during KKR or RCB matches to earn Travel Cash. 5? minutes is all it takes to use your Travel Cash ???????? Travel Cash will auto-credited to user’s account on every four, six, wicket, and more, provided the user keeps the Goibibo app open during KKR or RCB matches. Additionally, users would be able to earn Travel Cash by Predictions, Trivia, Scratch Cards, and more. Predictions - On predicting scores, wickets, winners during the matches, users will earn Travel Cards. Scratch Cards - Goibibo will send scratch cards on the app during matches which will help users to collect additional Travel Cash. Trivia - More Travel Cash can be earned by participating and answering correctly. Super Match - During the Super Match, when KKR and RCB will compete with each other, Goibibo will offer double earnings. Super Day - On the day, when KKR and RCB will play with other teams, Goibibo will provide double earnings to the users. Those who are new on Goibibo will receive a special signup bonus worth Rs. 100. For this, go to the Goibibo Travel Cash Fest page and scan the given QR code to receive the bonus. When will Users get the Earned Travel Cash? User’s account will be auto-credited with the Travel Cash after the match before 2 AM on the next day. Unused Travel Cash earned from previous matches will get expired at Midnight on the next day of the match. 100% Travel Cash can be used on Domestic Hotels booking on the first transaction. Users can use 50% Travel Cash on second transaction onwards. The minimum transaction value should be Rs. 2,000. Similarly, users can use Travel Cash on International Flights booking, provided the minimum transaction value should be Rs. 3,500. For International Hotels and Flights booking, users can use 100% on the first and second transactions. However, for the booking of International hotels, the minimum transaction value should be Rs. 3,000 while for International Flight bookings, the minimum transaction value is set to Rs. 3,500. 6 Domestic Hotels goPasses of flat Rs. 1,000 off. 3 Domestic Flights goPasses of flat Rs. 600 off. 2 International Hotels goPasses of flat 20% off. 2 International Flights goPasses of flat Rs. 3,000 off. The validity of goCash+ is for three months. Users can earn Travel Cash in every RCB and KKR matches. A Goibibo user is eligible to participate in all RCB and KKR matches. If a match is dropped due to rain or some other reason, Goibibo will credit the user’s account with a fixed Travel Cash amount of Rs. 200. For the case, users must be active on the Goibibo app during the match to earn Travel Cash. No additional Travel Cash amount will be provided in case the match is delayed or the total number of overs are shortened for some reason. In this case, the regular Travel Cash amount will be credited during the match. Goibibo solely reserves the right to modify, add or remove the earned amount during the matches. For the case of Super Over during the match, the scores and wickets will not be calculated for collecting Travel Cash. Expired Travel Cash cannot be re-instantiated. Reserve Now Pay Later hotel bookings are not eligible for the Travel Cash. Travel Cash may not be valid on certain hotels. Under the program, gifting of Travel Cash is not allowed. Used Travel Cash for bookings are non-refundable. The Goibibo Travel Cash Fest discount offer is valid till the last match of IPL 2019. Goibibo IPL Offer is valid only on Goibibo iOS and Android apps. Travel Cash won across multiple accounts cannot be combined into one account.